The following Q&A was originally published in The Washington Diplomat to highlight the diplomatic and global leadership work of U.S. 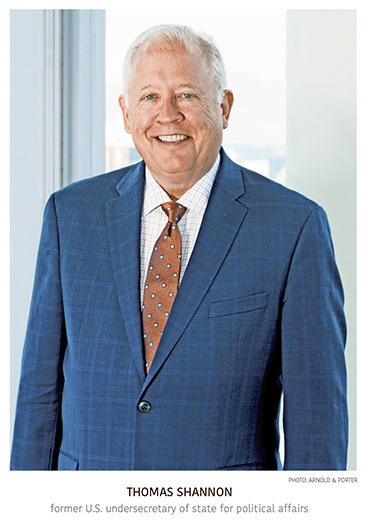 Ambassador Thomas Shannon, who serves on the advisory board of the Meridian Center for Diplomatic Engagement. The profile was written by Aileen Torres-Bennett, a contributing writer for The Washington Diplomat. Venerated U.S. 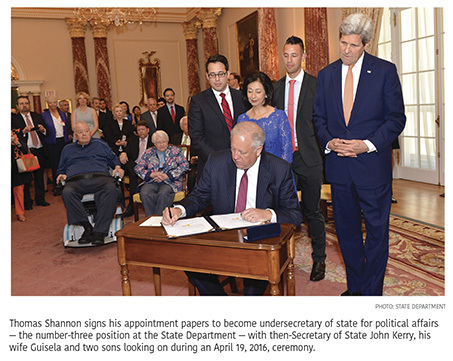 Ambassador Thomas Shannon retired in February 2018 after an almost 35-year career at the State Department. He started off as a consular/political officer in Guatemala in 1984 and ended as the third highest-ranking official in the agency as undersecretary for political affairs. He also briefly served as acting secretary of state during the fraught transition to the Trump administration, eventually handing the reins to former Secretary of State Rex Tillerson. But Shannon told reporters last February that after helping the agency transition to the new administration, he was moving on for personal, not political reasons, citing the recent death of his mother and the need to make way for a new generation of diplomats. (He officially stayed on until June 2018.) “Thirty-five years is a long time. I’ve fought the good fight,” he said. That “fight” spanned the globe and included high-profile postings as U.S. ambassador to Brazil and as a roving envoy focused on Africa, the Middle East and Southeast Asia under Secretary of State John Kerry. His wide-ranging diplomatic expertise also included sensitive talks with Russia and Venezuela, as well as helping to oversee Iranian nuclear compliance with the Joint Comprehensive Plan of Action (JCPOA). In addition, he supported U.N.-sponsored peace processes in Yemen and South Sudan, which, he regrets, were not successful under his watch. Shannon’s opinion carried heavy weight in the State Department. Among the last counsel he gave was a “constructive dissent” of Trump’s Temporary Protected Status (TPS) policy. The administration decided to end TPS for El Salvador, Honduras, Nicaragua and Haiti. El Salvador was granted TPS because of devastating earthquakes in 2001; Honduras and Nicaragua because of Hurricane Mitch in 1998; and Haiti because of the 2010 earthquake. The administration argued that TPS was meant to be temporary, not extended indefinitely, and that conditions back home had improved since the initial natural disasters that led to the TPS designation. Pro-immigrant advocates countered that ending TPS was a cruel decision that will force hundreds of thousands of law-abiding residents who have made homes here to return to countries still overrun by violence and poverty. Shannon agrees with the latter group, and the American Foreign Service Association (AFSA) recognized his efforts with its 2018 Christian A. Herter Award for Constructive Dissent. In his remarks at the awards ceremony in October, Shannon explained why he disagreed with the administration’s policy on TPS. Shannon is now a senior international foreign policy adviser at the law firm of Arnold & Porter and the U.S. board co-chair of the Inter-American Dialogue, a D.C.-based think tank. The Diplomat invited Shannon to discuss his take on TPS, as well as other key foreign policy issues. He also shared highlights from his expansive diplomatic career. The Washington Diplomat: You spent 35 years at State. What are you proudest of in your tenure, and what do you wish you could have had more influence on? Thomas Shannon: My years of public service as an American diplomat were a period of great honor and satisfaction for me. To serve my country across such a dynamic and momentous period in global history was an incredible privilege, and I am grateful to the six presidents and 11 secretaries of state under whom I served and who showed such confidence in me. I spent much of my career working in countries in the midst of profound change and transformation. From Central and South America to Southern Africa, I had the opportunity to use American power to shape and direct these periods of change to the benefit of the United States and the countries in which I was working. My four years in South Africa, from 1992 to ’96 [when anti-apartheid icon Nelson Mandela become the country’s first black president], were especially consequential and resonated in a powerful and positive way throughout the rest of my career. Of course, not all my accomplishments and satisfactions were professional during this period of time. I met, courted and married my wife, Guisela, during this period. Together we brought two sons into this world, and we raised them to manhood within the Foreign Service and traveling from one posting to another. My family remains a source of great pride and comfort. In a world facing so many challenges, understanding our limits in shaping global events becomes a refuge and protection. President Franklin Roosevelt once said of Lincoln, “Lincoln was a sad man because he could not get it all done at once. And nobody can.” Nobody likes a sad diplomat, so recognizing our limits becomes an important part of our effectiveness. That said, the three conflicts that were hardest for me to leave behind were Yemen, South Sudan and Venezuela. I helped lead the U.S. policy response and the diplomacy in these three crises. All three were unresolved when I retired, and I regret that I could not see them through to a successful conclusion. TWD: AFSA awarded you for your efforts to promote the extension of TPS for El Salvador, Honduras, Nicaragua and Haiti. How did you practice“constructive dissent,” and why do you think TPS was ultimately not extended? TS: [M]y constructive dissent regarding the decision to not extend Temporary Protective Status to El Salvadorans, Hondurans, Nicaraguans and Haitians living lawfully in the United States had two purposes. First, to ensure that the secretary [of state] had the best thinking, analysis and recommendations possible from the department and our embassies as he considered this issue. TPS had become politicized, and there was an effort to carry this politicization into department deliberations. I thought that inappropriate and therefore worked to protect the integrity of the policymaking process. My second purpose was related to the impact of the decision to not extend TPS. The decision undid nearly two decades of U.S. policy and overturned a bipartisan consensus on a migration issue at a moment when there was little common ground on such issues. Also, the decision needlessly harmed our partners in Central America and the Caribbean, and caused them to question our reliability as an ally. TWD: You managed State during the transition from Obama to Trump. What were the most pressing concerns of the transition? TS: The most immediate and pressing concern was to prepare the department to be able to respond immediately and constructively to the new administration. Our effectiveness depends on the trust that exists between elected leadership and career members of the Foreign and Civil Service. It was our purpose to respect the will of the American people and to help the incoming administration understand the immediacy of the national security challenges that it faced as the administration grasped the reins of power. To do this well not only required discipline, but also an ability to marshal personnel and resources. The very real problems that the department faced in staffing senior positions and funding our programs were significant challenges, but one that I believe we met. Now, under Secretary [of State Mike] Pompeo, I believe that the administration has hit its stride on foreign policymaking and implementation and that the value of the department and its officers is understood. TWD: Having led talks with Russia, what is your take on the current state of U.S.-Russia relations and Vladimir Putin’s refashioning of Russia’s role in the world? TS: The relationship between the United States and Russia has a deep and complicated history that shaped the trajectory of the 20th century. The aftermath of that century still haunts both countries and affects how they respond to each other. What is worth highlighting is that even in the worst moments of the Cold War, we found a way to maintain open communication and work to resolve problems of mutual concern. What worries me currently is that we have both shown a capability to cause problems, but we have shown little capability to understand and resolve problems. We have retreated to a position of accusation and disdain, and that is both sad and dangerous. It is my hope that in the months to come we can restart our bilateral talks and begin to establish some common ground on which to base the relationship. TWD: You helped to oversee Iranian compliance with JCPOA. What is your opinion on the Trump administration cutting U.S. support for the nuclear deal? TS: I did not agree with this decision. The JCPOA was a remarkable accomplishment, with significant nonproliferation benefits. Given what else the Iranians were up to in the Middle East and beyond, I thought removing the nuclear issue from the table, even if only for a determined amount of time, would give us enough time to strengthen our allies and change the balance of power in the Middle East in a way that favored our interests and undercut those of Iran. Also, the decision seriously harmed our relationships with key European allies and unnecessarily opened space for Russia and China in the Middle East. That said, I understand the great frustration felt by the president and others at Iran’s depredations and malign influence in the region. Having made the decision to withdraw, we now bear a very special responsibility to address the problem that Iran presents in a way that not only meets our concerns, but also those of our former JCPOA partners. TWD: U.S. presence continues in Afghanistan. Can you discuss the State Department’s strategy there? How long do you think the U.S. will maintain a heavy presence? TS: U.S. strategy and purpose in Afghanistan has been to support the elected, legitimate government of Afghanistan and enhance the ability of Afghan security forces to protect the state and the population from the Taliban and other insurgent forces. Our purpose has also been to deny terrorist groups such as ISIS any significant presence or space in which to operate. To achieve these goals, the U.S. works with our Resolute Support Mission partners in support of Afghan authorities. The U.S. has also supported efforts by the Afghan government to explore reconciliation efforts with the Taliban. This support has been expressed both bilaterally and multilaterally. Regarding the longevity of the U.S. presence, our support will continue until there is a viable and sustainable political solution to the current conflict. TWD: Now that you’ve retired from State and can talk more freely, what do you think the department’s priorities should be right now? TS: The State Department’s priorities, in regard to foreign policy, are always those of the president and the secretary of state. In regard to the institutions that are the State Department and the Foreign Service, both are in the midst of significant generational change. Fully 60 percent of the Foreign Service has been in for 10 years or less. This change has the potential to create a stable, experienced diplomatic corps that could serve continuously across at least two decades — if we can convince our officers to stay in place. This means providing them with the resources and training necessary to do their jobs, the support necessary to care for their families, and the respect and access necessary for them to have an impact on policymaking and its implementation. TWD: You’ve served under six presidents and 11 secretaries of state. Can you share some of your most memorable moments through the years? TS: I began my career under President Reagan and Secretary [of State George] Shultz and ended it under President Trump and Secretary Pompeo. Every president and secretary for whom I worked were great Americans and remarkable public servants. While there are many moments of importance and meaning to me, what most moves me as I look back across my career is seeing the role I played in the democratic trajectory of our great republic and its relationship with the world. Knowing that I was embedded in that journey is a source of pride and satisfaction. But my comfort is tempered by the knowledge that some of our biggest challenges lie ahead. In this regard, if I feel nostalgic, it is a nostalgia for a future of which I will not be a part. POST TAGS: ambassador, American Foreign Service Association, Brazil, Diplomacy, El Salvador, foreign policy, George Shultz, Global Leaders, Global Leadership, Guatemala, Haiti, Honduras, JCPOA, John Kerry, Meridian Center for Diplomatic Engagement, Mike Pompeo, Nicaragua, Obama, Public Diplomacy, Reagan, Rex Tillerson, Russia, State Department, Temporary Protected Status, The Washington Diplomat, Thomas Shannon, Trump, U.S. Department of State.